Meet the engineer/producer behind my Album Jon Hubbell. Jon and I have worked together on most of my projects. He mixed the Bieber project a couple years ago as well as played my last EP release show. He’s a great friend and a great collaborator. So much of the pride I take in this album has to do with Jon helping me see these songs through to their full potential. He’s a great composer and a wonderful friend. Here’s a little about Jon. How did you get into composing/producing? When my band in high school broke up I still had an itch to continue writing music. I found my dads old laptop and downloaded a bootleg recording software and was hooked. Ive been composing for television Ads and producing other artists ever since. What are some inspirations for you as an artist? Ive always been inspired by bands or artists that do the unexpected. Radiohead’ Kid A, Sufjan Steven’s Age of Adz, and Thrice’s Vheissu are albums that took me completely by surprise and explored sounds and styles that those particular artists had yet to visit. What do you like most about collaborating with other artists? Getting to explore what inspires another person. Sharing energy from another musician is important for your own inspiration and skill level. I write for television Ads so turn on your TV and enjoy the ride. I also write/perform under the name Bigfoot Wallace but its been awhile since I have done anything with that. Interview with Taylor Anderson, The Vocalist on the song "Daisy"
I’ve started taking lessons at 8 and I’ve been singing ever since. I sang all through high school and went to college for vocal performance, I started writing my own songs in college and that I’ve been writing and singing ever since! I currently am the music director at Grace Community Church in Tempe, AZ. Also, I am the VP of a non-profit called RNW Music and have my solo project under Taylor Anderson Music. Anything that instills or awakens passion makes me inspired! One of my greatest passions is my relationship with Jesus. He is such a wild, passionate, creative person. When I think about how he loves me, it makes me want to create out of that place of secure identity rather than out of a place of “ this needs to be a hit” or “I hope people like it”. The industry and listeners are fickle; but if I write songs I enjoy, I’ll never burn out on creating art. I find a lot of inspiration in the joy and humor in people. I love being able to catch an artist's vision and serve them. No artist, producer, or songwriter has ever achieved success on their own. We must have people around us who can challenge and propel us into who we are and what each song needs. Songwriting for me is less about the song and more about empowering and calling out the gold in the other's I’m working with. Art is developed over hours, a person is developed over a lifetime. Where can I find more and are you working on anything exciting? You can find my current single “Don’t Get Murdered” on all streaming platforms. I am working on releasing a few singles right now, as well as an album for RNW Music which should be released in March 2019. Please give me a listen and follow me on social media! Interview with Claire Gallagher, of Animal Theory. I’m so excited to introduce you to the brilliant mind behind the artwork for my Album. Claire Gallagher is a great friend and beautiful artist. She really made my vision come true and was so wonderful to collaborate with. Here’s a little more about Claire! How did you come up with Animal theory? Animal Theory was born out of the desire to house all of my creative endeavors (graphic design, illustration, music playlists, etc) in one place. For me, the name speaks to the contrast between the presence of animals and the headiness of humans. Animals are, humans think they are. So I like to try and play with that. Also the url was available. What are some inspirations for you as an artist and how did you get into it? The first thing that comes to mind is folk arts and crafts -- Mexican ceramics and textiles, Inuit printmaking, the quilts of Gee's Bend. There's such a vibrancy in all of these. I respond strongly to moods, and I love the idea of art being accessible and made by anyone. But I also like art that feels dark and strange, like Egon Schiele and Goya's stuff. I suppose I love life and color, but more-so against a backdrop of death and darkness. I got into art through working in film (though I had always made some form of art while growing up) - doing everything from pitch decks to set design. I have an English degree and a patchwork art education, so I think that's why I am drawn to a naive, democratic concept of art. Artists have a first hand understanding of and respect for the process. I've worked with a lot of folks who have no idea how something artistic, whether it's a logo or an illustration or whatever, is actually made. It's not entirely linear. So it's really nice to work with other artists because there's an unspoken understanding of how fickle creative work can be, and you don't have to rely on faulty language to try and communicate that. Over the past year since I've graduated from UCLA I've been working on various project. I haven't been able to share much as these projects are still getting final touches- or doing the festival circuits. 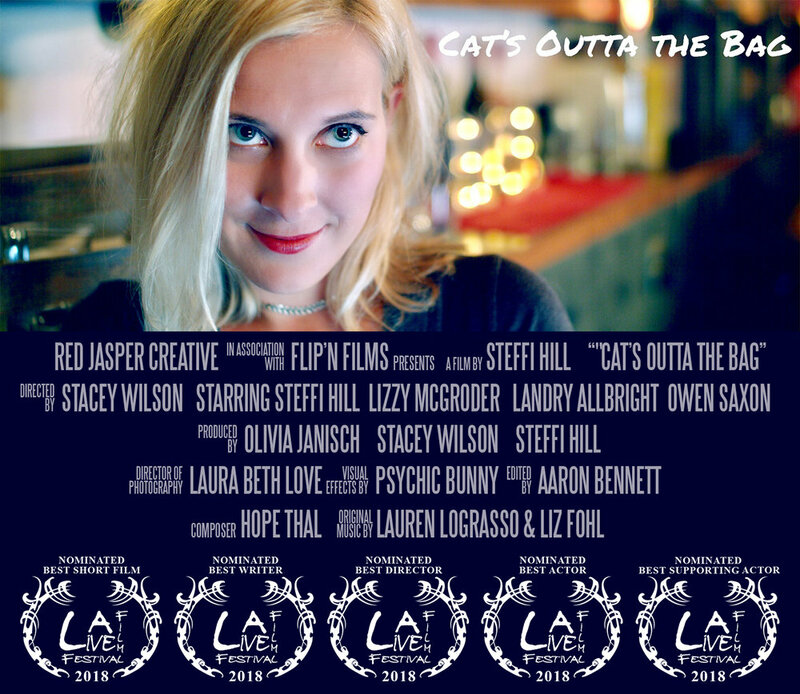 One of these projects is a short film called "Cats Outta the Bag" which has WON Best Comedic Short at the IFS Festival and has received several nominations for the LA Live Film Festival (see poster below). On May 10th we get to watch the film at the Grove Theatre in Los Angeles. I have to say that being in LA and out of school has made me realize how hard it can be to keep moving. This moment of getting to see a film I worked on have its moment in the spotlight is really rewarding. You have to savor these moments when you're on that uphill climb. Thank you to the team at Red Jasper for allowing me to be apart of this project! Today marks one year since I released my "Character Studies EP". That EP was a project created to build my creativity, write quickly, and learn how to mix my own songs. I'm still very proud of that project, but when I go back and listen, I'm happy that I know so much more now than I did then and would do a lot of things differently. I wanted to share what I've been up to since that release. Around April I started working on a 10 Episode Web Series called, "Meet Carole" that should be releasing very soon! That project was such an amazing step forward for me and having to do an episode a week really challenged me and taught me a lot. In July-ish I did the music for a short called, "Roommates" by my good friends Adam and Chelsea that will also be released soon. It has officially been two years since I moved to Los Angeles to do the Film Scoring program at UCLA. Last week I attended graduation and it is pretty surreal to think that my time at UCLA has come and gone. This program has been so much more than I expected and I genuinely feel equipped to begin building a career as a media composer. I came to LA with a degree in Voice; while the subjects aren't unrelated I felt extremely intimidated. For the past two months I've been writing the music for a web series (post on that later) and it has been so rewarding to know what I'm doing. Two years ago I would have felt completely clueless as to where to even begin. I've done many projects in this program that, when assigned, all I thought was, "what the hell am I doing here?". (see video below for example) To come to the other side of this experience and know that I was able to accomplish the tasks at hands, and experience so much growth as a musician and as a person makes this whole thing a beautiful blimp on what I hope to be a long career as a film composer. Here is the video clip of my final assignment in my conducting class- the last class where I got to work with musicians. 9am..."Alright time to check my email", she thinks. The ads roll in... Searches for that one name... Heart beats faster and faster... Nothing. 9:15... "Maybe now", she humors herself. *phone vibrates... Quick catch of breath... Just another Amazon ad... Time to make coffee. The hours drag on until about 4pm where she thinks, "here's to tomorrow”. Being a person who prides herself on grabbing the bull by the horns and achieving the goals set out before me, waiting for someone else to give you a chance is infuriating. I think to myself, "gosh I hate something so important to me being in someone else's hands". This reveals how much I think things are always in my control. In this experience I am learning that some goals aren't only up to you to accomplish. In fact many require a series of people who want to help, encourage, and cooperate. Sometimes that doesn't happen and that doesn't mean you failed, it means life isn't based off of your fantasies and it's probably better that way. When I really think about my experiences in life so far, I realize that my daydreams keep me excited, but hindsight is what is truly beautiful. Hindsight is what teaches me to persevere, that the real life outcome is always different and full of actual tangible memories and emotions that really taught me something. I'm looking forward to this experience being hindsight. Brb gotta check my email. In March of 2016 I released “The Bieber Project”- a collaborative work reinventing and arranging three songs off of the 2015 album release “Purpose”. The idea for this project was conceived within days of the November release as I fell deeper and deeper in love with the album. The difficult aspect in pursuing your creative ideas is to bring something from conception to reality. You need the people, money, time, talent; it’s all pretty daunting. In a city like LA it’s pretty easy to find the people (Ironically everyone, with the exception of Ben Dalton and Katie Grosskopf, was from PHX). For those of you with project swirling around in your brains all day like me, here are a couple things I learned from bringing this project to fruition. 1. Don’t be afraid to ask. To bring projects to fruition you have to put out a lot of asking; you have to be willing to let go of all your pride and ask others to be generous. I grew up going on trips with church throughout all my teenage years so in some ways, I have lots of experience with asking and seeing people be generous for no reason BUT, this was the first time that I was asking for no ‘greater purpose’ than my own creativity. I was immediately embarrassed by my GoFundMe and considered taking it down immediately, but then people gave. One of the messages I got said, “’Anonymous’ tried to explain what this is, not sure I get it but If you and Caleb are doing something I’m sure it will be great.” I think it took about 3 weeks for the project to be fully funded. If you want a high quality project, you need a budget- there’s no way around it. 2. Respect those around you. I firmly believe collaboration is the only way to create something wonderful. Going into a project thinking two minds are greater than one is a must. Perspective from people who are honest and who you trust is so important because after a while you become too close and start to lose it. Unfortunately, we cannot all be single creative geniuses. The people who create great art are the people who don’t have a problem acknowledging that. The people who’s project get created are those who don’t have a problem acknowledging that. I’m so thankful for Ben, Micah, Jon, Katie and Janie for collaborating with me and for being honest people that I can trust. 3. Get Organized. This is a lesson I’m continually learning as I work on school projects and the film scoring industry. I thought I was a pretty put together person but the truth is that it takes hyper organization to accomplish your goals. Someday we all hope to have the privilege of having the vision and letting someone else do the dirty work, in the meantime it's going to be you that has to carry the weight. The two days we spent playing music together was magical. Taking my bed apart and finding a place to put everything in my 500 square foot studio apartment wasn’t fun. Grocery shopping, cooking, sticking to the budget, putting together a timetable, those things are all just as important. I tried to be as organized as possible for this project and the truth is, it still wasn’t enough. The good news is there’s room for improvement in the next one. Watch the Rest of "The Bieber Project" under "Projects" tab. 1 year ago today my husband Caleb and I moved to Los Angeles. So far it has been a very strange mix of feeling fresh off the boat, yet more at home than we've ever felt. The credit for our quick adapting goes to Soma (our church) for embracing us as family from day 1. There is so much happening all the time in LA. It was difficult to get used to not being able to go to every event, concert, and social outing at first because there is just too much happening to be able to do it all. I thought I would share some of my LA highlights for year one. 5. Celeb sitings- because let's face it, no matter what that is fun. Favorites have been Jerry Seinfeld, Reese Witherspoon, Ian Somerhalder, Ellen Degeneres (on her show)and Sam Jaeger. 4. Star Wars- just the release of this movie was a highlight of my first year in LA and getting to see it with Ali Lowndes (friendship highlight) who worked on the film was very special. 3. Studios- every couple weeks in the 3 quarters I've been at UCLA we get to go to the recording studio. We use players who have played on some of the best scores ever. Being in real studios with such incredible players has been such an treat. I look forward to getting to do much more down the road. 2. Star Trek Live with Score- early on in our arrival I got to attend this event that included a Q&A with Michael Giacchino and a little encore medley from "Inside Out". It was a night I'll never forget. 1. Lunch at Bad Robot- Thanks to one of my bests, I had the privilege of going to my favorite production house for lunch and sharing the meal with the Music Supervisor, Charles Scott. The whole place was more inspiring than I could have ever imagined. As many of you know, my appreciation for the work that has come out of Bad Robot is extremely deep rooted and it was an incredibly fulfilling moment. A big adjustment to life as an artist in LA, is embracing myself as an artist. Why does it feel like someone needs to give us permission in order to actually be ok with calling yourself that? Maybe it is just me. Being in a city where there are so many self-proclaimed artists has actually been so wonderful. There are so many ideas all around us just waiting to be fleshed out and opportunities to collaborate. Because many people living in LA have sacrificed being close to family and living a much more comfortable suburban life to pursue something they are passionate about it has been really easy to relate and bond with so many people. Here is to year number 2! In the future this space is going to be used much more to talk composing. I would love to open up the dialogue of being a woman in this industry, and valuable things I learn on this journey. I wanted to get one "journal entry" in before I dive into all the music stuff. Thanks for reading.